I spent 2 weeks in Cambodia, in February, 2012. The photographic portion of my trip was limited to Angkor Wat and Siem Reap, the nearby town that serves as home base to visitors of Angkor Wat. The ruins are like nothing I've seen before, or since. 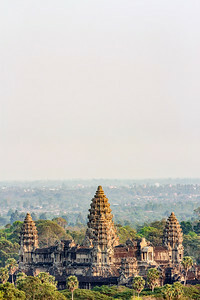 Angkor Wat as seen from Phnom Bakheng at dusk. The nearly constant haze makes seeing anything in the region difficult from a distance. Available in the following sizes (Rectangle B): 12x8, 18x12, 24x16, 30x20, 36x24. Angkor Wat as seen from Phnom Bakheng at dusk. The nearly constant haze makes seeing anything in the region difficult from a distance. Available in the following sizes (Rectangle B): 8x12, 12x18, 16x24, 20x30, 24x36. 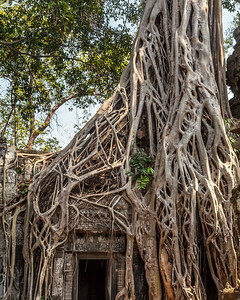 Ta Prohm is one of the few temples in the Angkor Wat region that has intentionally been left in the condition in which it was found after centuries of abandonment. Trees and vines now grow all throughout the site, and it feels like something from a movie or video game. 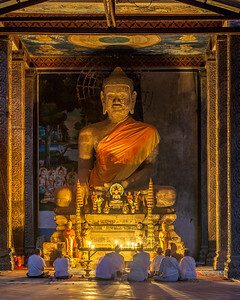 The unique state in which it exists, today, has made it one of the most popular temples with visitors. Available in the following sizes (Rectangle B): 8x10, 11x14, 16x20, 20x24, 24x30. 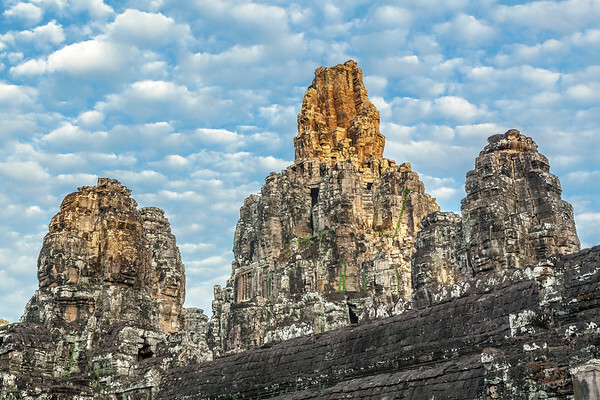 There are so many smaller ancient temples and structures around the more famous Angkor Wat that they eventually begin to blend together. I spent three days in the area, and although each of the temples had something of their own character, I must admit I eventually lost count of how many I visited. One thing that was great about the smaller temples was the lessened crowds, and the ability to explore, without having so many areas be off limits. Available in the following sizes (Rectangle B): 8x10, 11x14, 16x20, 20x24, 24x30. Banteay Srei is a much smaller complex than Angkor Wat. Located about 25 kilometers (16 miles) northeast of the main temple complex, the biggest difference to me was the construction material. Built of red sandstone, the entire structure seems to glow at sunrise (and presumably sunset). 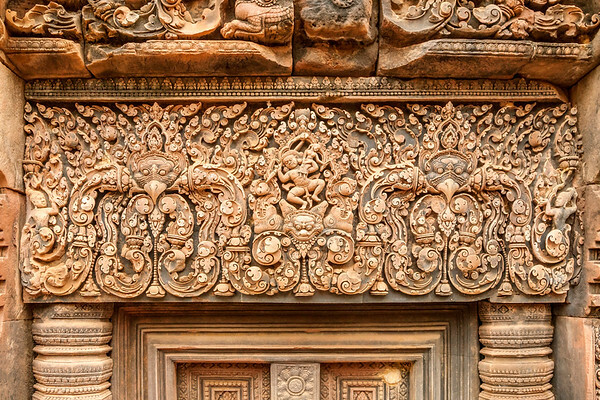 The detail of the carvings, while impressive at the more popular areas of Angkor Wat, is nearly unbelievable at Banteay Srei. Available in the following sizes (Rectangle B): 8x12, 12x18, 16x24, 20x30, 24x36, 30x45. 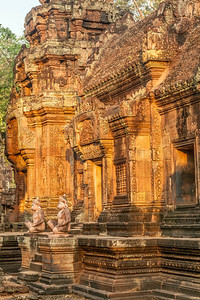 I was only able to spend three days in Siem Reap, and by extension, Angkor Wat and the surrounding ruins. I'd heard about another ruin a couple hours further north that, supposedly, got only a tiny fraction of the crowds that visit the main complex of Angkor Wat, and decided to give it a visit. The colors of the rocks at this temple – Bantay Srei – were vastly different from any I'd seen in and around Angkor Wat, and the intricacy of the carvings, which I can only assume have been cleaned up in recent years, was unlike any I'd seen before. Well worth the hassle to get to this far less visited site. Available in the following sizes (Rectangle B): 12x8, 18x12, 24x16, 30x20, 36x24. I was only able to spend three days in Siem Reap, and by extension, Angkor Wat and the surrounding ruins. I'd heard about another ruin a couple hours further north that, supposedly, got only a tiny fraction of the crowds that visit the main complex of Angkor Wat, and decided to give it a visit. The colors of the rocks at this temple – Bantay Srei – were vastly different from any I'd seen in and around Angkor Wat, and the intricacy of the carvings, which I can only assume have been cleaned up in recent years, was unlike any I'd seen before. Well worth the hassle to get to this far less visited site. Available in the following sizes (Rectangle B): 8x12, 12x18, 16x24, 20x30, 24x36. 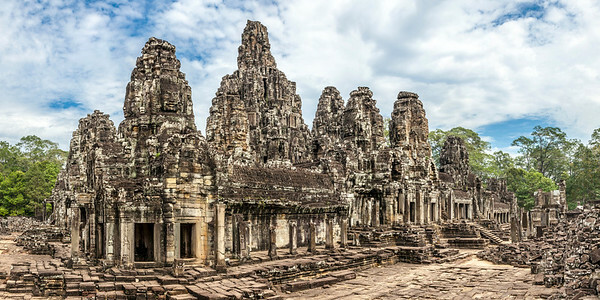 The Bayon – a temple that lies only a mile or two from the much more famous Angkor Wat – was one of my favorite places to visit on the entire “Angkor Wat” site, which encompasses many square miles, and countless long-abandoned structures. I made it a point to be here one morning at sunrise. I am able to count seven stone faces in this photo, but I can only guess how many may have been present when this structure was first completed. Available in the following sizes (Rectangle B): 12x8, 18x12, 24x16, 30x20, 36x24, 45x30. 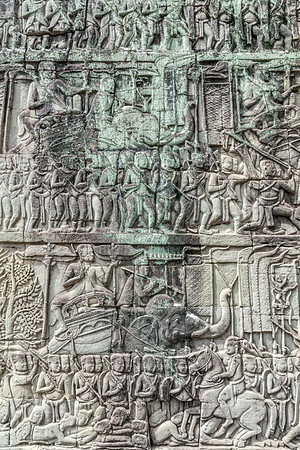 The main temple of Angkor Wat is certainly better known than the Bayon, but I think I preferred taking pictures here. There are less crowds, and its much smaller size makes it easier to explore. I enjoyed it enough that I made it a point to be here for sunrise (not this picture) on my second day at Angkor Wat. Available in the following sizes (Panorama A): 20x10, 24x12, 32x16, 40x20, 48x24, 48x24 Triptych (3 x 16x24), 60x30, 60x30 Triptych (3 x 20x30), 72x36, 72x36 Triptych (3 x 24x36). I wasn't aware that this photo opportunity existed when I was exploring “The Bayon,” one of the many ancient temples near Cambodia's world-famous Angkor Wat. 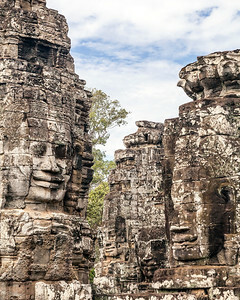 I was exploring on my own, and enjoying the site at a leisurely pace, when I overheard a Cambodian tour guide point the location out to his guest, and asked her to count the faces she could see from this one location. If you look carefully, you can see four faces in the stone carvings here. Available in the following sizes (Rectangle B): 8x10, 11x14, 16x20, 20x24, 24x30. 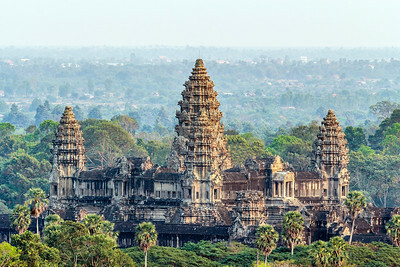 Cambodia's Angkor Wat – and the surrounding temples – take up a huge amount of land, and one could spend a lifetime exploring each of the temples and structures in the region. This carving is one of thousands that has survived the weathering of the ages. Available in the following sizes (Rectangle B): 8x12, 12x18, 16x24, 20x30, 24x36, 30x45. 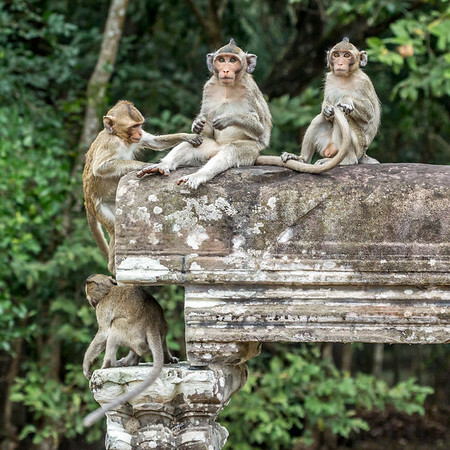 A group of long-tailed macaques. I probably saw over a hundred of these guys while checking out Angkor Wat and the surrounding temples. They were utterly unfazed by humans, and used many of the temples as jungle gyms on which to climb and play. Available in the following sizes (Square): 10x10, 12x12, 16x16, 20x20, 24x24. A group of long-tailed macaques. I probably saw over a hundred of these guys while checking out Angkor Wat and the surrounding temples. They were utterly unfazed by humans, and used many of the temples as jungle gyms on which to climb and play. Available in the following sizes (Rectangle B): 8x12, 12x18, 16x24.